why sell with reagans real estate? The real estate industry is a competitive one...what sets reagans real estate apart from the competitors and why should you choose us to sell your property? 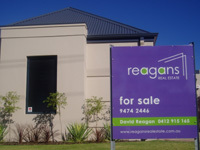 David Reagan (principal and licensee) of reagans real estate has over 30 years experience in the real estate industry and has a sound knowledge of residential property sales and leasing, investment and the small land sub-division process. He is committed to providing a comprehensive, professional and personal service.